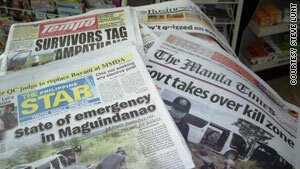 The massacre has dominated the front pages of Philippines newspapers. The Manila Times: "Politics in the Philippines is a long way from being civilized and democratic"
Manila, Philippines (CNN) -- Filipinos are used to violence during the run-up to elections -- they'll often say with a sad shrug, a grimace and resignation that it's "normal." They're only too aware that politics can be a dangerous business in this country, so often mixed with guns, greed and money. Police say 148 people were killed in the 2004 national elections, political clans control private armies, and over one million unlicensed firearms are in circulation, contributing to the general lawlessness in many remote areas. But the political massacre in Maguindanao, where 57 people were killed -- including many non-political civilians and journalists -- was "unprecedented in its savagery" and "diminishes all Filipinos, whether Christian or Muslim," according to the Cebu Daily News. Following this most gruesome act of political violence ever in Mindanao, the country's media are immersed in the story. The Manila Times said: "The politically motivated massacre of civilians including more than a dozen newsmen is savage, barbaric and unGodly. That such a thing could happen is another proof that politics in the Philippines is a long way from being civilized and democratic." Ordinary Filipinos are however often reluctant to give their full name on record when interviewed about a subject as politically sensitive as this. Cristy -- an office worker in Manila -- gave a typical reaction: "It's horribly sad and at the same time, it makes us Filipinos angry. So many innocent people died brutally because of other people's greediness. Isn't it enough that our country is already suffering from poverty and crisis? It's very sad what politics could drive others to do. The government should act responsibly on this and seek justice for the victims the soonest time possible." People are concerned that the violence has started early, as the massacre is likely to be the first of many killings before the elections next May -- when posts from village leaders to the President will be pursued with grim determination. Ordinary Filipinos and their outraged media representatives are hoping for -- but not expecting -- a speedy investigation into this atrocity. Police have named a political ally of President Gloria Macapagal-Arroyo as the prime suspect -- Andal Ampatuan Jr., a member of Arroyo's ruling Lakas-Kampi-CMD coalition and son of a powerful regional politician, who has ensured local support for the President in previous elections. Three policemen, believed loyal to the Ampatuans, have been detained for their alleged involvement in the murders. But Janina, an office worker in Manila, is not confident of the prosecution process. "Sure, President Gloria Macapagal-Arroyo has declared a state of emergency in Maguindanao," she said. "But in reality, it is almost general knowledge that it will take a long time before justice is served because GMA and the Ampatuans are political allies." The Manila Bulletin commented that even more than 24 hours after the "senseless murder of scores of people," there was still no apparent concrete government action. Vicky, another office worker in Manila, put it more firmly. "People are disgusted on the very slow action by the government on the massacre," she said. "Considering that the culprit was the biggest supporter of our current president, Gloria Macapagal-Arroyo, during her campaign to sit her in power, perhaps causes the delay in pointing out in broad daylight the people responsible. The process of solving problems and heinous crimes seems impossible when politics is involved." Vicky now believes Maguindanao will always be known as a "fear zone." Many here are afraid that political warlords and their armies will continue to carry out vendetta killings and intimidate voters; they also doubt the government's ability to secure election hotspots around the country. Amnesty International has said the killings underline the danger facing civilians across the entire country in the lead-up to next year's elections. "The government must prohibit and disband private armies and paramilitary forces immediately," said Amnesty's deputy director in Asia, Donna Guest.